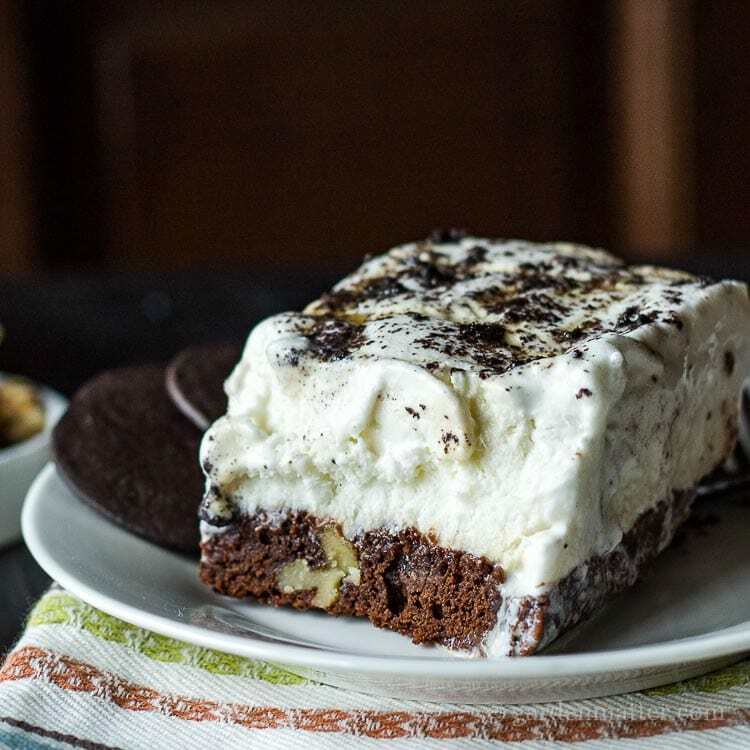 I made this easy ice cream brownie cake for Christmas Eve. We had a few cookies and candies, and my sister also brought over a nice tray of cookies, but I just had to serve something in addition for dessert. It was last minute, but I couldn’t believe how easy and yummy this dessert turned out. You’ve probably ordered a brownie dessert served with ice cream before. That was my inspiration for this yummy cake. Using a large lasagna pan I made a simple box of brownie mix with the addition of chopped walnuts, and bittersweet chocolate chips. I never noticed the bittersweet chocolate chips before. In fact, I was amazed at all the different kinds of chip flavors that were available. Milk chocolate, dark chocolate, white chocolate, peanut butter, butterscotch and of course the traditional semi-sweet chocolate chips, were all available at our local grocery store. You know what that means right? You can choose your favorite chip or chip combination to create your own spin on this recipe. Don’t stop there. Change up the nuts or maybe add in chopped candy bar pieces. Once the brownie layer cooled I spread two containers of vanilla ice cream on top. Yes, you could use a different flavored ice cream here too. The top is decorated with crushed chocolate cookie wafers, and drizzled on salted caramel sauce. Yet another place where you can get creative and make it your own. How about chocolate sauce, watered down raspberry jam, the possibilities are endless. Two of my other favorite things about this recipe; you get to make it ahead, and it tastes great leftover. Mix brownie mix eggs, water and vegetable oil per the package directions. Butter your baking dish to prevent sticking. Pour into a deep large baking pan. Cook per directions on brownie box. Once the brownie mix has cooled and the ice cream is soft, spread it onto the brownie layer. Top with crushed cookies and drizzle caramel sauce. Cover with foil and place into refrigerator until firm. Oh my this looks wonderful, something about dessert and winter just fits perfectly. You should put together a recipe book with all these amazing things you share. I know what you mean. Winter is a time that I always feel indulgent when I should really be getting back. Thanks for the cookbook idea. I just might try it.